As the sun was just beginning to peak over the horizon, I pulled the MAF operations car into its parking spot at Kajjansi airfield. The reddish/orange colour of the sunlight reflecting on the clouds at the horizon provided a breathtaking backdrop to the equally stunning image that greeted my eyes in the foreground. Looking down from the MAF terminal building I could see our aircraft all parked in a line down on our apron area. Looking further across the bay area of Lake Victoria I could see the hills bathed in the morning light on the other side of the bay. A thin layer of grey mist floating across the middle of the hills added to the overall beauty of the setting, and I had to work to pull my thoughts away from the beauty that surrounded me and turn my attention to the task at hand. Turning around and walking into the building, I greeted our ground ops workers who were already there and preparing for the mornings passengers to arrive. On this particular Friday morning I would be flying one of our Grand Caravan aircraft around northern Uganda on our “Karamoja Shuttle”. The Karamoja region lies in the northeastern part of Uganda, and is known for the extreme drought and primitive living conditions there. Because of these conditions there are many different missions and agencies that are working hard to bring the news of the gospel of Jesus to the people living there. At the same time they are also working to enhance the standard of living for the people there. There are medical missions, clean drinking water missions and many others, and MAF is the conduit that is often used to bring these missions the people and supplies that they need to carry out their work there. On this particular day, my planned routing was to fly from Kajjansi up to the town of Gulu to drop off some workers there. From Gulu I would head further northeast up to the remote village of Kaabong, where someone would be waiting for me to pick them up for their flight to Kampala. Leaving Kaabong, I was to fly south to the village of Kotido, where I would drop off another passenger and then fill the plane almost to capacity with workers who were heading back down to Kampala. On a normal Karamoja shuttle we usually send only one of our Caravan aircraft, but on this day there were two of us heading up there due to the number of people that we were transporting back to Kajjansi. Too many people for one aircraft, too many for one Caravan and one 206 aircraft, the only way to get everyone where they needed to be was to dispatch two of our Cessna Caravans, the workhorses of our MAF Uganda fleet. I was a little relieved that there were two of us headed up this morning, as it meant that my flight wouldn’t be too long today. It was after all, Friday, and an early start to a weekend is always pleasant. After fueling up and completing a thorough pre-flight, I headed back up to our terminal building to collect my passengers and take them down to board the airplane. As we made the walk down to the airplane, I was able to converse with one of my passengers for a few minutes. He told me that he was here in Uganda representing the Christian Counselling Fellowship. He, along with two others in their group, was headed up to Gulu to visit one of the projects there. The three of them, Karl, Brenda and David, were to be there for 10 days. The project that they were involved with was a girl’s school, where they were doing their best to prepare village girls for the lives that they would eventually lead in their home village. In addition to the basic schooling that is available in most schools, they were also trying to prepare the girls by training them in a Christian environment to run a household. Many girls are married at a very early age and are thrust into the role of wife and mother while they are still very young. This mission was trying their best to give these girls the skills that they would need to be able to survive and hopefully prosper when they were married. In addition to visiting the project up near Gulu, the team that I was flying was also headed out to various villages to get a glimpse of what daily life is like for the women who were currently living in the villages. They were going to be doing their best to analyze the current curriculum in their school and find out if the school is adequately preparing these young women for their future lives, or if there were still areas of training that they could add to the schooling. As they looked at both the school and the surrounding villages, they wanted to be sure that the training that they were offering was applicable to what the lives of these girls would actually be like when they left the school. As we flew northwards that morning, visibility was slightly better than what we had been experiencing for the past few weeks. As is the case on most mornings, once airborne and cruising in the smooth, cool air at 10,000 feet, most of my passengers were enjoying a short nap before we landed and they de-planed. On this morning however, one passenger was wide awake and quite excited to be flying over Africa on this beautiful morning. Each time that I looked backward to check on my passengers during the flight I saw a wide smile stretched across her face and her neck was getting a good workout as she turned her head back and forth again and again to see out of both sides of the airplane. Seeing this was good for me as this was the same lady who had shown a little bit of apprehension about boarding such a small airplane. That apprehension was long gone now, and the smile only got wider when I offered her my Uganda chart so that she could follow along with our flight. Gulu was our first stop. It is one of only three tarmac runways in Uganda, and the government has recently done a lot of work to it and made it a very nice place to land. As I removed the luggage from the cargo pod underneath the airplane, the three passengers were very effusive with their thanks. They were very clear to me that it is the ministry of MAF and the airplanes that we fly which allow them to spend as much time as possible in ministry while they are here in Uganda, rather than spending much more time traveling on the roads. The work of MAF is making a difference to their ministry in northern Uganda. Only a few minutes later we were airborne again, winging our way further northeast towards the small community of Kaabong. This is one of our more challenging airstrips which we fly to here in Uganda, and today was no different. The winds were gusting strongly down the ridge with a quartering crosswind as I lined myself up on final approach. I was very thankful for the turbine engine spinning away only a few centimeters in front of me. This airstrip is located at a high elevation and the extra power available to us because of that engine gives us a greater margin of safety every time that we land there. 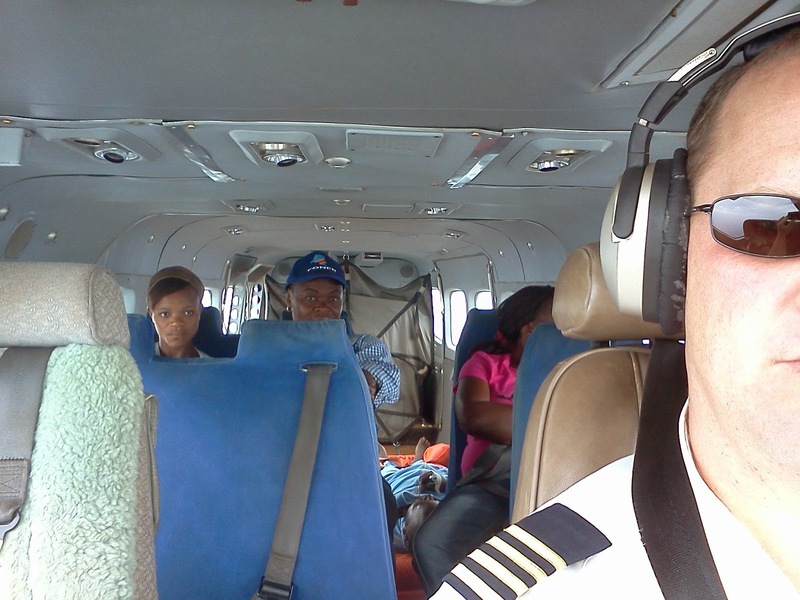 We landed safely and picked up another passenger and were soon flying southwards toward the village of Kotido. Upon landing in Kotido, I disembarked my last passenger and then turned to deal with the nine passengers who were waiting there for me to pick them up for their flight to Kajjansi. Everything went smoothly and in seemingly no time at all we were all airborne again, leaving the small dirt airstrip behind us and climbing up into the smooth air above the clouds, making our way south back towards Kajjansi airfield. As we neared our home base, I began my descent and started to allow my thoughts to move towards the weekend that lay ahead for my family and I. I had only one more landing on this day and then I would “put the plane to bed” for the weekend and head home. Then I received a call over the HF radio. I was asked if I would call the office on my phone when I was on the ground, as they needed to talk to me. I had the gut feeling that my day may not be over quite yet. After landing and shutting down the engine, my passengers once again expressed their thankfulness to me for the work of MAF and the difference that flying makes to them and their missions. As they left the airplane and walked up to the terminal, I pulled out my phone and called the office. My gut instinct was correct. My day was far from finished. There were two patients who had been injured in a car accident, and they needed an emergency medical evacuation flight out of the town of Bunia, in eastern Democratic Republic of the Congo. As I hung up the phone I looked over and got the attention of the fuel guys and about 40 minutes later I was airborne again, fuelled up and heading for Entebbe International Airport. Clearing customs and immigration is a very fast process when there are no passengers on board, and before long I was once again up at 10,000 feet, bumping my way westward towards the boarder of Uganda and the DR Congo. By this time in the day the convective air had made its way higher into the flight levels and there was no chance for me to climb into smooth air. This was no problem for me now, but as I flew onwards I hoped that the day would begin to cool down in the next few hours before I had to fly with patients in the airplane. Cooling air means a much smoother flight, which always makes a medivac flight more pleasant. Landing in Bunia, I taxied up to the parking area and shut down the engine. As I climbed out of the airplane I was greeted by several Congolese employees of the MAF Congo program (MAF Congo is based in Bunia). They informed me that the patients were on their way to the airport, but were traveling quite slowly, so they didn’t know exactly when they would arrive. I thanked them for the information and prepared my airplane for their arrival. Back in Kajjansi I had already removed two bench style seats and two single style seats from the airplane, as we had been informed that the patients both required stretchers. I opened the large rear cargo door and prepared my tie down straps and fasteners so that when the patients arrived I would be able to load them, secure them, and then depart as quickly as possible. That large cargo door is a blessing when it comes to transporting patients on stretchers. It is much easier for both the people who are doing the carrying and for the patients as well, as they can be lifted directly into the back of the plane without having to be carried up the stairs and through the smaller passenger door. After a short wait, the patients arrived at the airport. Both were men who had been involved in a car accident and both had the same type of chest injury. Neither man could breathe without experiencing pain, and the location of their wounds also made it more difficult to secure the stretchers safely to the floor of the aircraft. With some help from our MAF Congo friends and a little bit of creativity, we soon had the passengers secured in the aircraft and were ready to head back to Entebbe. Because none of my passengers spoke English, I had one of the MAF Congo team translate my pre-flight briefing for the passengers. I would be carrying the two patients, as well as three other ladies who were coming along to act as caregivers for the patients while they were in hospital. I described the impact that altitude can have on people who are having trouble breathing, as well as a few other medical issues that can arise as a result of flying. We agreed on a signal that the ladies could give me if there were any complications that arose during the flight, and with no further delay we were on our way back to Entebbe. As we crossed over Lake Albert and back into Uganda, I was thankful to find that the air was very smooth again. I was able to fly at an altitude that provided plenty of oxygen for my patients and yet was smooth enough that the bumps would not aggravate their injuries further. Blessedly, the entire flight to Entebbe went with no hiccups or problems for either myself, the plane or the patients. For many of the patients that we medivac, their flight is the smoothest, safest part of their journey, with the ambulance ride on either side of the flight being a hair raising ride through traffic that can at times be described as almost psychotic. As a pilot I am thankful for the chance to be able to minister to these patients by offering them a flight in an airplane, rather than a long, arduous overland journey to wherever their final destination lies. 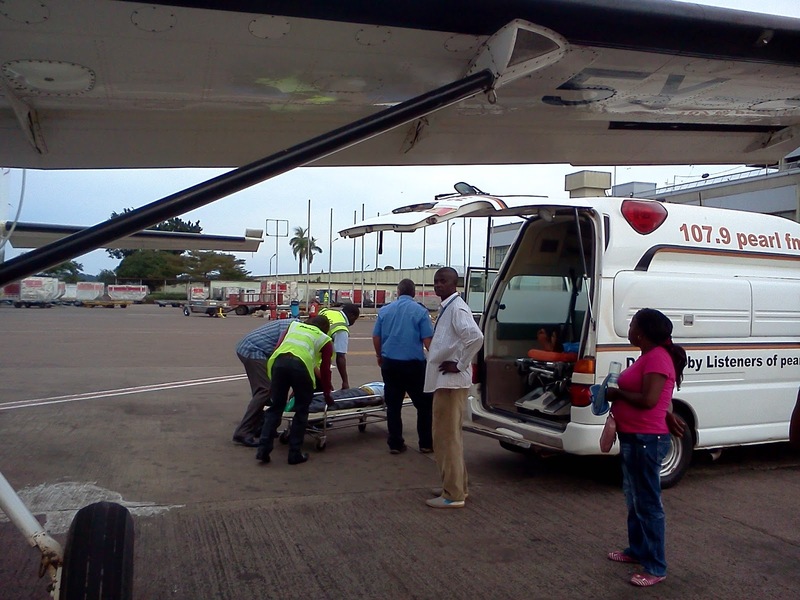 Upon arrival in Entebbe, our airplane was met on the apron by two ambulances as well as another MAF pilot who had landed there a few minutes in front of me and had waited there to give me a hand. I was very appreciative for his help as we unloaded the passengers and helped them load into the ambulances. In very short order they were leaving the airport and were on their way to the medical help that they so desperately needed. Only ten minutes the wheels of my plane softly touched down the red earth runway back at Kajjansi, and I taxied up to the parking area and shut down for the last time that day. What a day. Thanks to this gravity defying machine that I was privileged to pilot for the day, I had flown people from several different missions to and from several remote locations, and had then been able to provide a much needed medical flight from another country. Even though I was tired to the bone, it was the very satisfying tiredness of a day well spent and a job well done. The story above is only one day in the life of one pilot at MAF. Days like this could not happen without the prayers and support that we receive from people all over the world. You are a vital part of the ministry of MAF here in Uganda, and we could not be here serving the people of east Africa without your generosity and support. From this pilot, thank you so very much.